Earlier this week, I was congratulating myself that my tomato crop had been a reasonably good one, especially considering the fact that the summer had such a slow start. 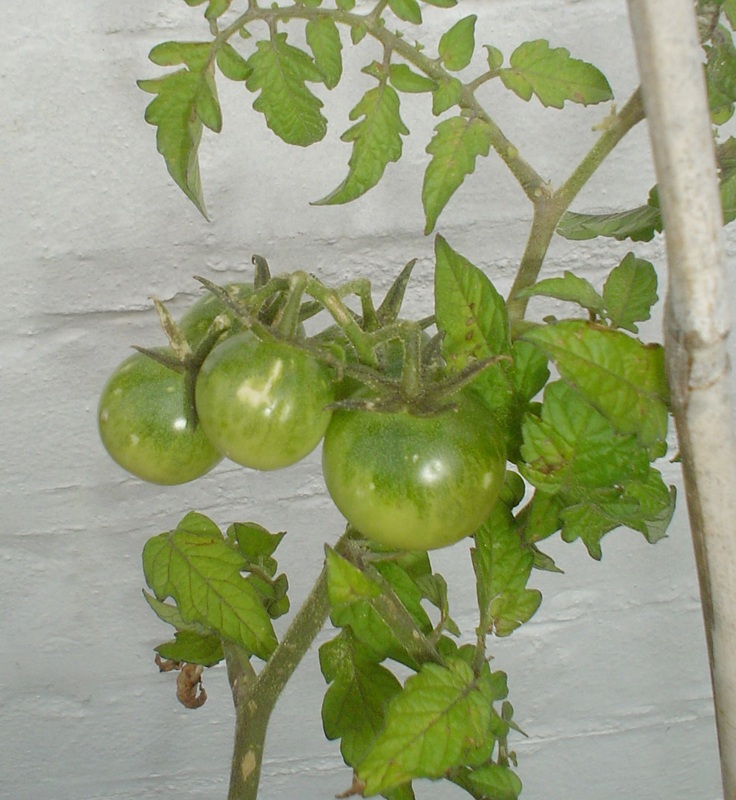 However, today I noticed something that shook me out of my complacency a bit – many of my tomato plants had tiny “nibbles” on the skin of the fruit and also on the stems/leaves. The pic below shows an example (click for biggering). As of last week I have been feasting off the strawberries in containers in our front garden – although sadly, the ****ing snails are feasting off them too. I make a point of doing a “snail check” every morning and evening, and any that I find get unceremoniously chucked into the shrubbery on the other side of our front path. I don’t use slug pellets (don’t want to cause harm to local bird/cat life), so the snail checks are the price I pay. But the strawberries are worth it. 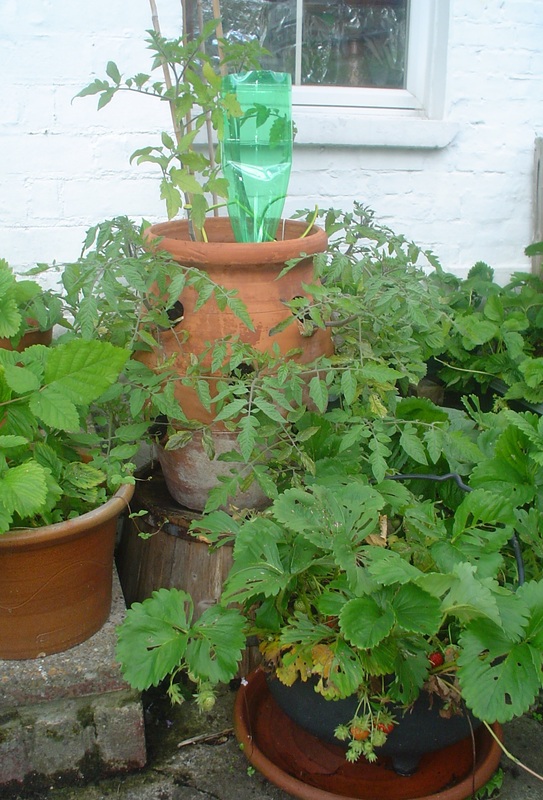 Amidst the strawberries is this fine terracotta strawberry planter, which I’ve planted with… Tumbling Tom tomatoes. My neighbour from three doors down gave me the planter – he doesn’t have time to garden right now so I’ve promised him some of the fruits of my labour. (In case you’re wondering, the two tomato plants growing out of the top of the planter are Gardener’s Delight.) 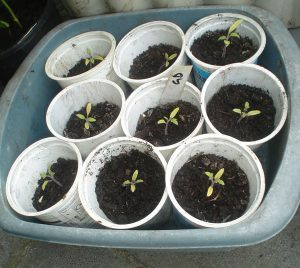 All my tomatoes are doing OK a week after being potted up. 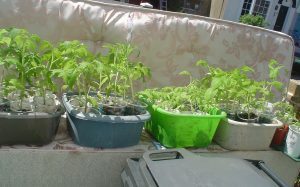 None of them have flowered yet though – don’t think we’ll be eating any home grown tomatoes till August. Handy tip: to speed things up each day when you put your toms out for hardening off, keep the pots in old washing up bowls or something similar that has reasonably high sides. The pots are secure when you lift the bowls and carry them outside, and won’t fall. I haven’t been spending as much time in the garden as I should, because I’ve been doing odd jobs around the house. One of these jobs was to get rid of our old bed and buy a new one. The new bed was self-assembly so that entailed a whole day of screwing leg A into frame B, and swearing copiously when it all went wrong and had to be dismantled. Mr Beans tried to help but he’s not a huge DIY fan either. However, we got there in the end. So this weekend I had a lot of gardening jobs to catch up on, including potting up my tomato plants. This is where the old divan came in handy. At the time of writing it’s in two halves, both propped on their side in our front garden, waiting for Thanet District Council to take them and the mattress away. As luck would have it, the tops of the divan halves were *just* the right height for me to use them as a potting table. I could stand comfortably at my full height, without stooping over and doing my back in. Other jobs done this weekend: planting more seeds – peas, spinach beet and spring onion. I don’t feel very optimistic about the spring onion because the first lot of spring onion I planted back in March hasn’t come up. Well, there are a few whiskery seedlings but not the full container of tiny plants you’d expect by now. I’m not sure if it’s down to the cold weather, or the fact that the seeds may be too old? If the second batch comes up OK, then weather must be the answer. The seed trays are sitting on our windowsill, covered with a piece of metal grille to stop the cats from kicking them about. This year I’ve planted Gardener’s Delight, Brandywine and Tumbling Tom. …which was 13th of November. In a normal year, we’d have kissed goodbye to the last of our tomatoes in late September/early October. But this wasn’t a normal year. 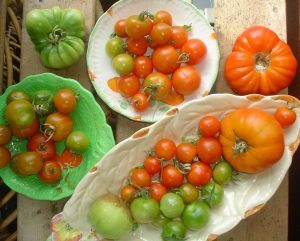 I placed the unripe Gardener’s Delight tomatoes I’d picked when I took down our tomato plants in a bowl and left it on our dining table. Amazingly, most of them ripened, and only a few turned into those horrible frostbitten monstrosities that tomatoes become when you’ve left them out in the cold weather for too long. I ended up putting them in a chilli con carne. In normal years, I would be blackberrying in mid-August. But this isn’t a normal year and I predicted that the blackberries would be a couple of weeks late. Sure enough, they are! In fact, it turned out there were quite a few unripe ones so I may make another trip in a week’s time. Today’s crop has been washed and put in little tubs in the freezer. Instead of making crumble or jam, I will mostly just thaw them out and eat them raw with yoghurt and oats for breakfast. In other news, Mr Beans and I have managed to work our way through five jars of the morello cherry jam. I will be sorry when it’s gone. In still other news, my tomatoes have finally started to ripen. 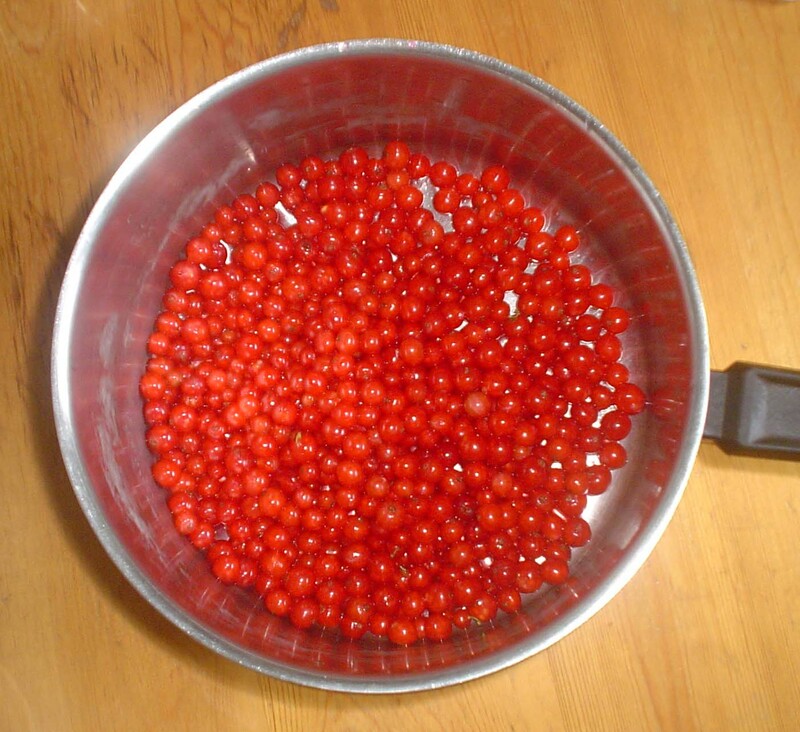 Anyway, back to the redcurrants. They are superb. I never expected this much fruit from just a couple of bushes. Since that first saucepan-full, I’ve picked three more lots and there will be at least one more to go. The first batch was stewed with enough sugar to give a sweet-but-tart flavour. Stewed redcurrants make a great accompaniment to roast pork or poultry. The rest are being frozen in batches. Another success story this year has been our rhubarb patch (in the corner of another raised bed), which has finally got going. I’ve managed to get four or five batches of stewed rhubarb from it. In the process, I discovered a tasty way to eat it – with vanilla yoghurt. Rachel’s Organic Vanilla is nice, if expensive. Or you can buy supermarket’s own natural yoghurt, and add sugar/natural vanilla to taste. For a more substantial dish – a proper meal as opposed to a dessert – add raw porridge oats to the yoghurt, stir in and leave for half an hour before adding the fruit. Sadly, it’s not all been good news. The mouse melon seeds I planted at the same time as my tomatoes grew into healthy looking seedlings, which I hardened off outdoors before potting up and placing against our extension wall. A couple of them have died and the others are not growing at all. I don’t know what went wrong there. Not enough sun, I suspect. I still have some seeds left so will try again next year.